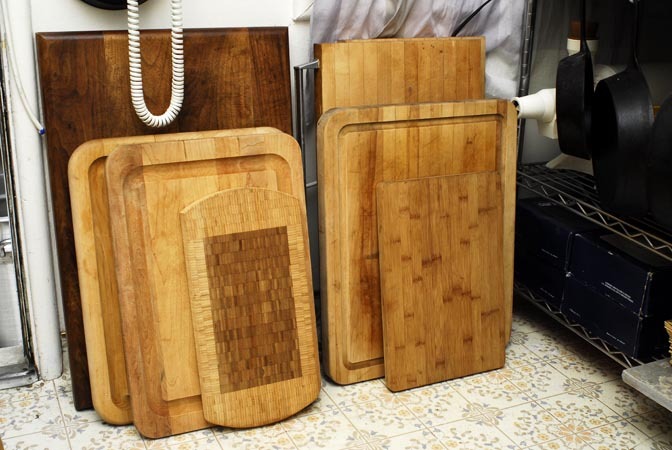 If I can't oil my cutting boards with mineral oil, does anyone have any other suggestions ? Eg peanut oil, coconut oil, sesame oil or any other ? Does anyone actually have any experience of oiling with cooking oil and having it go rancid ? I thought that in theory oil can only go rancid when it is heated to past a certain temperature (different for different oils) and the molecules start to break down. I assume in practice no one actually heats the cutting board so this should not be an issue - or is my science all wrong ? No, oils can go rancid at room temperature. I believe oxidation is the primary cause of rancidity. You MUST ONLY use mineral oil. Mineral/beeswax Add beeswax shavings to mineral oil and microwave for a minute or so depending on quantity. The wax stays in solution. Also use this solution foir long term storage of carbon steel blades. Stick with an inert oil like mineral oil. It adds nothing to the taste, will not turn rancid, is fairly inexpensive, is easy to find at your local drug or grocery store and is an effective coating. All organic oils will oxidize over a period of time causing the board to become unusable and dangerous. Some nut oils can cause an allergic reaction to those who are allergic to nuts. Don't want to use mineral oil.....Use melted bees wax instead. A little more difficult but this will provide a good water resistant coating to your board without using mineral oil. Or, you can use nothing and do like the old time butchers did. When they stopped working for the day, they scraped their blocks and applied a coating of salt overnight. The salt absorbed the moisture in the wood, killed the bacteria and sanitized the surface. The next moring they swept the salt off and started to work. I watched my Uncle do this, he was a butcher. If you use ANY kind of organic oils, they will turn rancid. This includes grapeseed. Take a chance with your own health and don't take chances with anyone elses health by recommending an organic oil. Wanted to stop by and thankee for the words. Huge fan of the wood, no plastic here, none in the family far back as '46. Here's my daily users up against the wall, under the phone. Champion Juicer poking out there on the right with a few cast iron pans there. Those black pans hard to illuminate. There's only a few of note, the huge teak one on the left, in the back. And the maple handled one on the right. I found that attached to an older portable dishwasher and unscrewed the sucker. It broke in half, but use it for taking to parties when cooking for crowds. If I can't oil my cutting boards with mineral oil? Why can't you use mineral oil? Just to clarify a couple of things: rancid oil is not a health hazard. rancidity comes from the oxidation of unsaturated fats. It causes off-odors and flavors, but has nothing to do with microbial spoilage. Also, I dispute the idea that olive oil or vegetable oils will rancidify in a cutting board. I have been using food grade oils on my three cutting boards for over 15 years. Mostly cheap olive oil, because I always have a lot of it around. Not only have I never smelled any rancidity, but after the oil soaks in I don't even smell the olive oil. I just get the faint smell of maple. Disclaimer: all the boards I currently use are edge grain. A friend suggested to me that end grain boards (like the ones the Boardsmith makes) drink up much more oil, so rancidity could be in an issue with those. I can't comment from experience. But you don't have to worry about anyone's health. By the way I have one of his boards on order; they're beautiful. If you get one, you might as well maintain it the way he tells you! Even after reading the above link, all I can say about rancid oils is YUCK! Who wants rancid oils on a cutting board even if it safe from microbes. It smells and tastes lousy. It is so simple to just use mineral oil which is cheap and so readily available that even the thought to use a vegetable oil with all its problems totally escapes me. I've used olive oil on my butcher block countertop (edge-grain again) for maybe six years now and have never detected any note of rancidity whatsoever. Yes, I have the answer to this one. You can buy the "Block Oil" for Wood and Bamboo sold by Homewood / Block Bros., San Anselmo California. With peanut allergy becoming so common I would think that using peanut oil could be very dangerous to some people, regardless of the rancidity issue. The school district here does not allow students to even bring peanut butter sandwiches to school for lunch. Some people are so sensitive that merely breathing on them after eating peanut butter, or peanuts, is enough to cause a bad reaction.